The smallest version of the Blue Water Candy JAG series, these “babies” combine the finest in nylon hair and soft mylar fibers available. 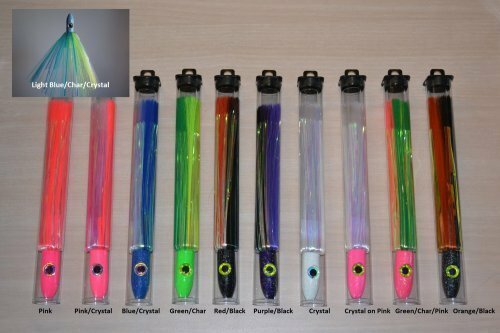 Premium powder paint and flake coatings with molded eyes make a nice skirt for daisy chains, nose baits, and to build dredges. 5/8 ounce in weight. 6” in length. Use with mono up to 150#. Contact us for Custom Colors! Buy 12 or more & save!